Why should you go to the dentist in Federal Way every six months? Dr. Drew Beaty tells his patients that preventive care keeps teeth and gums from expensive and complicated restorations. Smiles remain bright and shining, and preventive care fosters good overall health. What Happens At A Routine Exam? Also, a skilled hygienist cleans and polishes your teeth, removing harmful plaque and tartar. She may apply fluoride varnish to prevent decay and reduce dental sensitivity. Protective plastic sealants are appropriate for children’s molars and for adults, too. Low radiation X-rays as needed complete the comprehensive exam. More than 100 million Americans do not get regular dental check-ups, says the American Dental Association. This neglect leads to devastating oral health problems, including missing and loose teeth, tooth decay, gum disease, jaw bone recession and undiagnosed oral cancer, a serious threat to oral health and overall well-being. When your family dentist considers the evidence, it’s no wonder he recommends semi-annual exams and cleanings for patients of all ages. 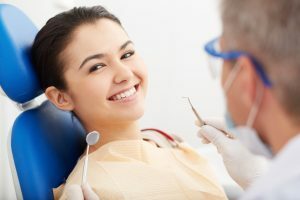 When a patient visits Dr. Beaty, he or she receives important information on dental hygiene, the latest treatment and diagnostic techniques and other health-related topics. Children really benefit from their appointments as the hygienist and dentist reinforce at-home teaching received from Mom and Dad. Contact Dr. Beaty and his dedicated team to schedule your check-up. Your disciplined dental care will pay great dividends in oral and systemic health and an attractive smile.